The old man was in a hurry to put a bowl of milk closer to the cliff, from where he has been overwatching the Danube often. Hoping for the help he was praying to the aquatic fairy to save his boat and to clear the clouds for him. The wind from the west was speeding up and the clouds were thicker, so he knew he must hurry. The fairy(vila) was the only answer in this kind of a dangerous situation. Suddenly, the water became darker and choppy, and from the wild waves rose up a snake-like creature. It flew to the sky changing the winds and chasing out the clouds that were threatening. The milk was spilled. The old man couldn’t see it, but the vila must have drunk it. Everything happened in a blink of an eye. How could he see it when he closed his eyes because of the dust and the fear? But he just knew it. The vila took it, she saved him, and the Danube was blue again. The storm was chased away. He could see the Sun again, and the clouds were running behind those hills. This is what our ancestors would have reported. Today this would sound more like – The weather is changeable and the water is full of whirlpools. 🙂 Nevertheless, the inspiration is the same as it was a couple of thousand years ago when these kinds of legends were born and the first houses were built here on the riverside. 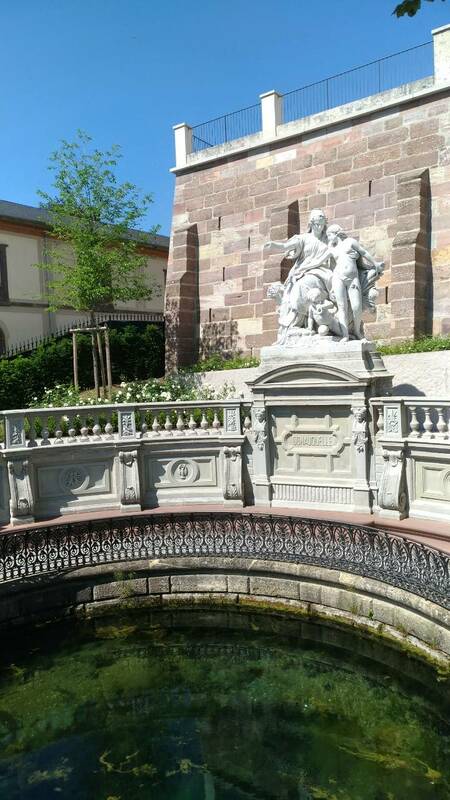 Donauquelle – the source of Danube is located just east of Donaueschingen town in Germany. It’s formed by the confluence of the two streams Brigach and Breg. On the marble board at the entrance of a castle ground, where this river begins its journey, the name of the Danube is written in all the languages of the states that it passes through. Also, the real work of art is decorating this spring, as it deserves special treatment. We could see a reflection of the coins that were thrown away in the water. I’m not sure if it’s good to “coin” the source down, or if it’s allowed, but if you have a wish apparently the source is the right place to wish it. I found this explanation for that. All in all, our experience was completed with a pleasant drive through the forest and the unplanned visit to the beautiful Konstanz lake.